Listen to this the rich sound from this wonderful brass band from Benin - the Gangbe Brass Band. Find out more about the Gangbe Brass Band, their available CDs and planned 2007 appearances at http://www.gangbebrassband.com/ . If you get a chance to hear them, its worth going out of your way. They played for over an hours and gave 100% the whole time. Hurrah! While looking around, I found this link to an mp3 on the Genting Jazz Festival web site of the band playing. Live recording at Essaouira World Music Festival 2007 of Baaba Maal playing at the Place Moulay Hassan . This set immediately preceded the Band of Gnawa set, and, like that, was recorded from the Restaurant Bab Lachour. If you've ever ben to Essaouira, you'll know that it gets pretty windy there, so, you won't be surprised that the music fades a little. 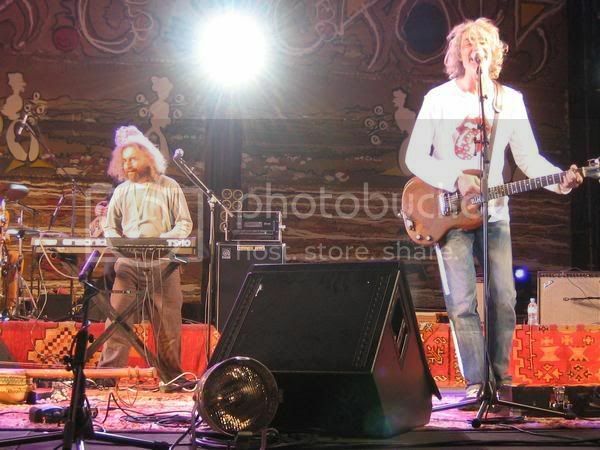 Live audio-only recording at Essaouira World Music Festival 2007 of Cheik Tidiane Seck (Keyboards Mali) with Will Calhoun(USA Drums). Listen to old DaftNotStupid himself ramble on after the Tagada set. John and Maggie chat about the Maalem Mahmoud Guinea with Cheick Tidiane Seck set that's just finished. Live recording at Essaouira World Music Festival 2007 of Maalem Mustapha Bakbou with Moktar Samba ( Drums Senegal), Louis Bertignac (Guitar France), Jean-Philippe Rykiel (Piano France). Believe it or not, I left this session at Bab Marrakech (Saturday night 23rd June) before it ended, to see Maalem Abdeslam Alikane with Tyour Gnaoua and Ray Lema over at Moulay Hassan. See my blog entry for more about that. However, I have four pieces from this set, all about 10 minutes long and featuring Louis Bertignac's haunting guitar. 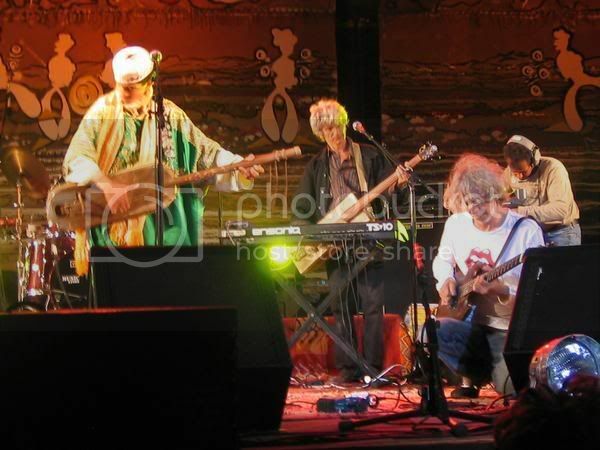 Another posting about the 10th Essaouira Gnaoua and World Music Festival in June 2007. One of the other Musical Creations this year was put together by Loy Erlich who has been one of the Essaouira Artistic Directors since 2000. 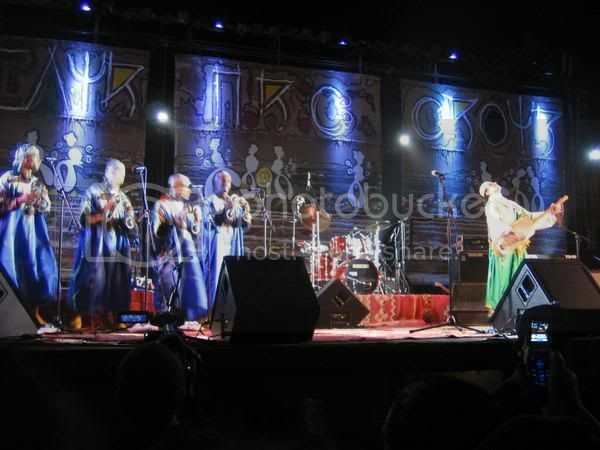 Loy Elich (keyboards bass France) joined the Band of Gnawa with Louis Bertignac (guitar France), Jean-Philippe Rykiel (guitar France), Akram Sedkaoui (vocals Tunisia), Cyril Atef (drums percussion) and Maalem Said Boulhimas (gimbri Morroco) along with four other Gnaoua musicians (choers percussion). The band started with Maalem Said Boulhimas and his Gnaoua musicians - I've just found about 20 minutes of him leading the whole group which I'd forgotten that I'd recorded - I'll post this to YouTube as soon as I can and then embed it here. The band then switches to more of a rock session, with the old Beatles number Come Together moving on through Hendrix's Who Knows to end on Gallow's Pole, they enchanted the crowd with rich rock fused with Gnaoua. Maggie and I agree that this was the session of the festival. Thanks guys! The old Led Zeppelin number Immigrant Song. Listen for the break to Gnaoua around the 3 minute mark. I recorded this set from the balcony of the Restaurant Bab Lachour, clamping the mike to the balustrade. It's a great place to see the concerts in Place Moulay Hassan and one of the few places in the medina to serve alchohol. You need to buy a ticket on the nights of the festival but that includes food which is always good there - the lamb chops and little baby soles are especially good. Thanks to e - C h i l l . . aka.. SuperUnknown.. for the great photographs. 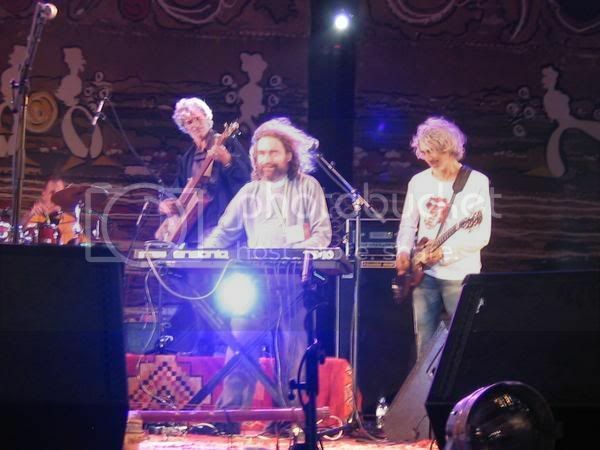 This is my first posting about the recent Essaouira Gnaoua and World Music Festival. 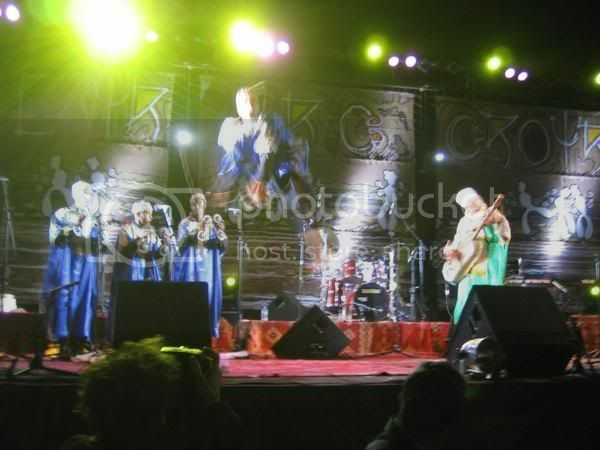 Maalem Abdeslam Alikane (Guembri Morocco) played with Tyour Gnaoua and Ray Lema (Guitar, Keyboards Congo), Adellah El Miry (Violin Morocco), Soriba Kouyate (Kora Senegal) and Mokthar Samba (Drums Morocco-Senegal), Camilo Nu (Guitar Mexico) at the Essaouira 2007 Gnaoua and World Music Festival in June 2007. Part of the through track 9, they were joined by Jean-Philippe Rykiel (Keyboards France who had been playing in the Mustapha Bakbou concert over at Bab Marrakech - listen out for his distictive guitar of the mp3 player of this concert in the right hand side-bar of this blog. Thanks to Camilo Nu for advising me (via my YouTube channel) of the corrected line-up for the concert. I had previously being showing Cyril Atef on drums and Jean-Philippe on guitar and hadn't acknowledged Camilo at all. Sorry for the mistake - I'd been using the line-up shown in the festival guide, and, I guess that they are subject to last-minute changes. In answer to nirvomind I recorded this piece (http://uk.youtube.com/watch?v=V4Dg1fRLowM) at around 23:00 on Saturday night (23rd June) at the Moulay Hassan. Maalem Adbelkebir Merchance played at 20:30 on the Friday night in the Moulay Hassan at which time I was recording Hoba Hoba Spirit at Bab Marrakech. It may interest Blogger readers and listeners on my YouTube channel (http://uk.youtube.com/DaftNotStupid) to know that Maalem Abdeslam Alikane is one of the founders of the Essaouira festival and that this session was one of three Musical Creations sponsored by the festival this year. Alikane chose this occasion to reunite musicians he has played with before and who have a strong affinity for Gnaoua music. I believe that this session was one of the high points of the festival, though my wife still thinks I'm stupid for missing out at the Asian Dub Foundation who played at Bab Marrakech at the same time. "Daft not stupid" I said. Anyway, I did record a short rehearsal of theirs which is also available on my channel. Unusually, I made this recording in the audience, close to the stage. I like the richness of sound I get there and being deep within an Essaouira audience is a wonderful social as well as musical experience. For the technically minded, I clamped the microphone to the scaffolding of the official TV platform, so I was not only optimally placed but was able to dance without holding the microphone for 2 hours. Anyway, thanks for listening. 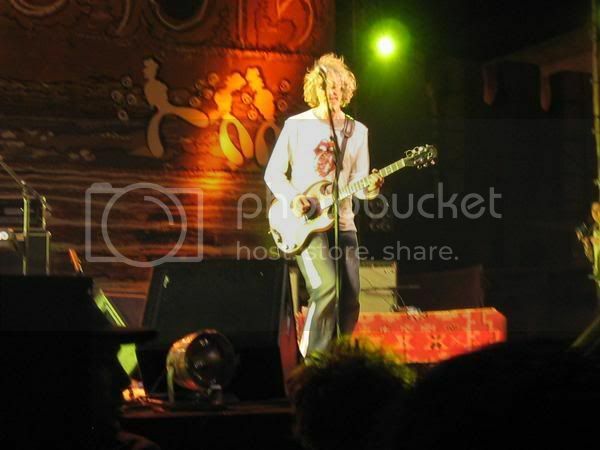 I'll be posting more great music from the Essaouira 2007 festival, so why not subscribe so you'll hear straight away.